Yesterday, the board approved the assessment committee’s redesigned standards. They are as follows. The standards are ordered in increasing difficulty, with the expectation that many first year WISRD members may struggle with the later standards. We have attempted to balance giving enough examples that WISRD members feel the expectations are clear without telling them exactly how they can meet these standards. Regarding publications, we have begun to receive drafts as the deadline for articles approaches. We still need to find editors, but we will likely not begin this process until we return from outdoor education and college week. I’ve just joined the assessment committee to help redesign the assessment model in WISRD. My plans for the year include working on that, running publications and the board, and helping with the retention study. As new projects come up, I will likely get involved with them as well. So far, we have had 1 board meeting, where we formed the assessment, retention, and dark matter day committees. I’ve joined the assessment committee, where we are discussing making the new assessment model be similar to the CV I filled out the year prior, as it had real life implications. We have also determined that we need to redesign the standards to better represent what WISRD is trying to do and provide more clarity to WISRD members. We have also recently had a publications sponsored writing workshop, where we discussed the expectations in formatting and level of writing, as well as worked with people to determine the topics they will be writing. We have also set the deadline for rough draft submissions to be midnight 9/28. For this year’s publications, we have decided to split up who will be submitting first semester and who will be submitting second semester based on time in WISRD and grade level. Returning sophomores and juniors will be submitting first semester, and new members and seniors will be submitting second semester. This split is an attempt to manage the number of submissions we get at once and to balance out the quality of articles for each issue of the magazine. We have just published the latest version of The Inquirer. It is available to read here! We were intending to publish the journal by the end of the year, but as the weather balloon project was unable to collect data, and the majority of original research articles were intended to come from that project, the deadline has been extended. This week I applied to work as a research assistant at the UCLA Semel Institute for Neuroscience and Human Behavior. I was able to use my CV that I had created the previous year for my WISRD reflection, which made me really consider the real life applications of something that I thought would never be so useful outside of WISRD. I have also been continuing work with the anthology, as well as working on editing and delegating edits for the WISRD magazine spring issue. Throughout my time in WISRD (the Wildwood Institute for STEM Research and Development), I’ve grown in a number of ways, perhaps most notably my skills as an independent learner. Prior to joining the Institute, every class I’ve ever taken followed a similar model. Do the homework, pay attention to the lecture, and take a test, write a paper, or complete a project to prove that you’ve really learned anything. Though it might not sound it from the somewhat formulaic way I’ve described it, I go to a very progressive school. Despite this, it was a bit of a shock to the system to come into WISRD, which I expected to be just another class like any other, and have to adapt so dramatically. This adaptation took place in a variety of areas, and was present from my very first day in the Institute. I joined WISRD as a freshman, when the Institute was just entering its first official year (after a preliminary “year 0”). As a result, there were not already the myriad of options facing the incoming freshmen of today, which was both a blessing and a curse. Rather than feel overwhelmed by my choices, I was able to decide which area to pursue based off of which of the limited options appealed to me the most. Despite this, I felt a strong sense of trepidation at the prospect of entering an Institute where most other members seemed to be more experienced than me, as I mentioned in my first ever journal entry (See journal entry on 8/30/15). In that first journal entry, one concept I brought up was my interest in learning more about the Goldstone Apple Valley Radio Telescope (GAVRT). In the following WISRD meeting sessions, I met with Joe to see how I could pursue that interest. I was “nervous to get started, as I [had] no idea what I [was] doing” (See journal entry on 9/13/15). This thought process perfectly exemplified the school mentality I was so used to. The idea of starting a project without a strong baseline of knowledge was entirely foreign to me, and I was strongly affected by my fear of failing. As the year went on, I continued to work with GAVRT, and grew more confident in my abilities to successfully navigate the radio telescope and understand the signals I was picking up. This growth was documented in my journal, and can be seen in the journal entries of 11/1/15, 11/8/15, and 2/1/16. During this first year in WISRD, I also began to work on projects that I am still involved in today, more than three years later, or that have influenced my opinions and interests regarding STEM fields and beyond. By my fourth week in WISRD, I officially held the title of Assistant Editor for the WISRD popular science magazine, The Inquirer (See journal entry from 9/20/15). Prior to joining WISRD, I had been under the impression that I could either pursue STEM related fields or the humanities, and, for most of my life, as a result I had only thought of myself as a reading and writing centric individual. When I entered the Institute, I believed that I would have to find alternative ways to pursue my other interests. Resultantly, I was ecstatic to hear about the magazine, and wanted to be involved in whatever way possible. In a more traditional setting, it would have been unlikely that a freshman with no publication experience would be allowed a leadership role, but I was encouraged to join because of my passion for the field. The next year, I became the Senior Editor for the magazine, and I also began the process of redesigning the magazine as a whole, a process I am still working on today. This further exemplifies another cornerstone of WISRD—longevity. Were I to see WISRD like any other class, it would be unlikely that I would choose to take the class for four years straight, and even more unlikely that I would stay working on the same project for the entire time. However, one of the many benefits to the Institute style of learning is the depth of understanding and knowledge that it allows members to attain. By continuing to pursue the same projects (specifically the magazine) over the past three years, I have been able to develop an understanding of editing, delegating responsibilities, collaborating with others, and leading that transcends the understanding that a typical high school class would provide me with. Throughout my time in WISRD, I have quite often found myself with the desire to do something but lacking the knowledge required to do it well, or to understand the details if I did manage to get it done. This could be seen from my first project in WISRD, working with GAVRT, to my most recent projects. As previously mentioned, I began my involvement with GAVRT without much prior knowledge of radio frequencies and the electromagnetic spectrum. Though it would have been possible to control the radio telescope and record the observations without this knowledge, the experience as a whole would have taught me significantly less and failed to prepare me to further pursue any experiments, labs, or concepts within the field of astronomy. Instead, I spoke with WISRD’s Chief Operating Officer (COO), Joe Wise, to establish what would be the most important concepts for me to learn, which I then proceeded to research throughout the year. Evidence of this research can be found in the journal entries of 9/26/15 and 10/4/15. This experience of needing to direct my own learning has been a constant throughout my time in WISRD. This past fall, while researching for an article I was writing on new social psychology research methods, I came across a number of mathematical terms I was unfamiliar with. As I have yet to take a statistics class in school, I wasn’t entirely clear on the concepts of standard deviation, P-values, P-curves, and P-hacking. Rather than cut it out of my article, I decided to do what I could to develop a basic understanding of these terms. Through reading articles and talking with one of WISRD’s visiting scholars, Dr. Alicia Breakey, I was able to come to a new level of understanding on these topics, and I worked to include mentions of them in my writing as well. Thus, three years into my time in the Institute, I first felt that I had truly demonstrated the learning outcome of utilizing math as a language, by allowing it to improve my writing. After countless hours in WISRD, a number of projects, and many publications, I still see myself growing as a learner and individual in new ways. I have started my Wildwood Community Involvement, where I’ve decided to work with Joe and WISRD. Below is my first reflection on this process. As I am working as the WISRD intern for the next semester, I went over the community involvement norms and guidelines with Joe this Wednesday. As I work very closely with Joe, and have for the past three years, it was an interesting dynamic shift (a more formal one) to attempt to navigate. Joe said that he would be happy to provide a more formal environment for me if I thought it was necessary, but that he also thought it might work best just to continue with our current dynamic as it’s proven to be very successful. We also went over what my main goals for the rest of the semester might look like, and settled on a few concrete plans. Joe has asked me to begin to write for the WISRD Anthology that he would like to publish, and to use some of the CI time to both work with him and work independently on writing. In addition, we discussed the importance of leaning into my stretches and using the time to learn more about how to use the different WISRD machines and facilities so that I am able to help out where needed and add value to the community. I am optimistic that this semester will be a learning experience for me, and I hope to be able to repay the favor by helping out with whatever Joe needs done in WISRD to help the Institute run seamlessly. After returning from Winter break, I have continued to work on the magazine and collaborate with Aidan, the graphic designer. As of now, all articles have been submitted to Aidan, and the design for the first few is completed. Through my CI work with Joe, he has taken me to visit Dr. Vandana Thadani at Loyola Marymount University. I got the opportunity to hear a bit about her work and ask her a few questions about entering the field of psychology. What was your educational path and specialization process like? Have you worked with a high school/college student before? What sort of thing could a student do to facilitate this sort of connection? Resume, contact, etc. What role does psychology bring to your educational research? What are some methods or techniques that you implement in your research? Any chance I could get a tour? My biggest takeaway from the meeting was the importance of contacts, and how far a mentor can go in the educational process. In addition to working with the magazine, I have been working with Ihsan in conjecture with the Wildwood Chemistry class to create a mold for the soap assignment. Because the object we wish to recreate with soap is so complex, I was concerned about the soap coming out of a mold with that many crevices. 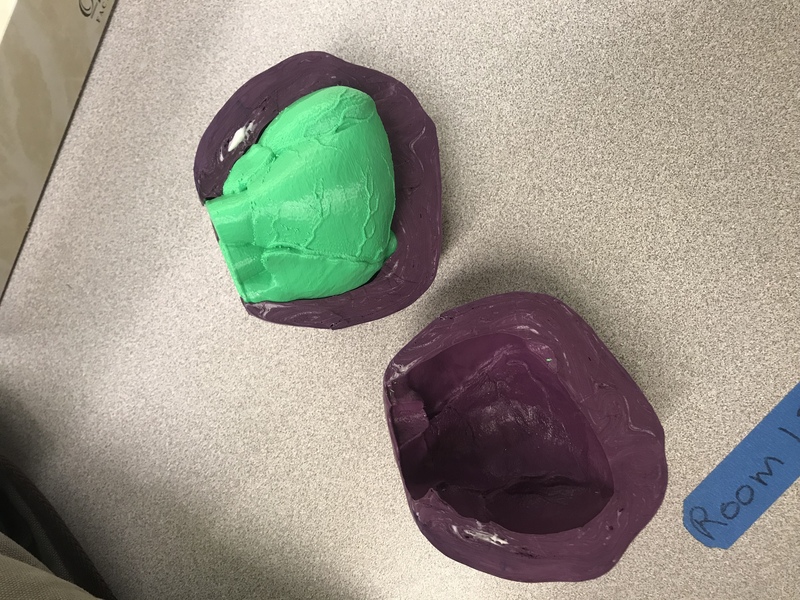 As a solution, I planned to use the same method created for the Gummy Bear Project where we printed a positive and then made a negative out of food-grade silicone mold mixture. This was once again successful, and the soap mold has come out perfectly, retaining all the desired detail from the print. Scott and I have been working hard on getting the magazine ready for the publication date before winter break. However, with the increase in number of articles we’ve received, the greater number of editors involved with the magazine, and the heavier graphic design we have planned, we’ve established that it just isn’t feasible. As neither Scott nor I have had experience with actual graphic designers for the magazine before, we didn’t allot the proper amount of time for design to get done. Most everything else has stuck to the schedule, with almost all articles turned in a few days after the deadline and edits returned on time, but there just isn’t the time for the graphic designers to get their work done. Therefore, Scott and I have decided to publish as quickly as possible upon return from winter break, and to publish a smaller issue of about 10 articles. We will then publish a second issue before spring break, and a third before summer. This way, the amount of work graphic designers have to do is more evenly spaced, and we even increase our number of publications. Lastly, Scott and I also went through each of the articles we’ve received (which is about 34), and picked out 11 for the first issue of the magazine. Today was the first meeting of Women in WISRD (WoW). Every woman involved in WISRD was send an invitation, and everyone responded, either with their attendance or their apologies that they could not attend. I started the meeting by discussing my reasoning behind creating WoW, which was hearing from women that they had not had proper support or outlets for help in the past year in the survey. However, Alicia and I also went into the meeting without a rigid agenda, as we wanted the members to have their own say on level of commitment and what issues we want to tackle and how. To get to know each other better and further create a sense of community, each person went around introducing themselves and discussing what they have done in WISRD and what their plans for future WISRD involvement are. We then heard from a few first year members about a desire for more support coming into WISRD, and the idea of a mentorship program was born. Someone mentioned that returning women of WISRD could partner up with a new member at the beginning of the year, and help the new member find their lab and get off the ground. I also brought up my goal to increase the percentage of women in WISRD, which many people shared. It was proposed that we present at the elementary school to promote involvement from a young age, as well as to the middle school. Lastly, Alicia and I had initially planned for WoW to meet once a month, but a desire for more frequent meetings was expressed, and it has been decided that WoW will attempt to meet every other week. As of right now, those involved in the magazine are Aidan, as lead graphic designer, Ihsan, as assistant editor, Dani and Jojo as editors, and Scott and I in our usual positions. We need to get more editors, in order to minimize the workload when first drafts come in. Because we will be requiring all drafts to be submitted in the fall semester, the editors will have a double workload. Ideally, we would like 10 people editing so that each editor has to edit approximately 3 papers. Scott, Ihsan, and I will all be able to take on more, but for the more junior editors it would be ideal to have a more manageable workload. In addition, at InnovatEdLA, we added 9 people to our mailing list. Scott and I presented our presentation on the publication process, where we covered topics like formatting, content, and deadlines for the magazine. Others involved in the publication process presented for each of the WISRD sections. We have also been speaking with students who are interested in getting more involved with the magazine in the roles of editors and graphic designers. The presentation is available to view under publications. Find it here. Scott Johnson and I have been working on polishing and improving the publication process. Below is our list of item to do and new ideas we are going to implement this year. The biggest change will be having a mentoring process where we help facilitate the writing experience for WISRD members. We are also changing the submission deadline so that every article is due before the first issue comes out, leaving us with more time to get the editing done. We also want to diversify the content of the magazine this year. Small interesting blurbs and boxes – history, recent developments, sidebars, etc. Columns – editorial, humor, puzzles, etc. The raw data is included in the data stream that is transmitted via bluetooth. You can get that decoded using our SDK provided below. Last week was the multicultural symposium, where Jackie L and I did a workshop on gender diversity in STEM fields, titled Why Should We Care About Gender Diversity in STEM?. About 20 people attended. Below is the schedule from the workshop. Why does a disparity exist? Give an example of gender bias or discrimination. What is self oppression? How does it impact gender diversity? These statistics, among others, were presented to the group. I believe the workshop went well and was a successful balance of fun and educational. I definitely see an improvement from last year’s workshop, where it was too statistic heavy and relied too much on the conversation of those attending the workshop. Today we made four more batches of molds for the gummy bear project, as well as improving the purpose statement for the project. For detailed uploads, please see this page. Jackie and I have decided to revamp the Multicultural Symposium workshop on gender diversity in STEM fields. We are in the process of reading a book titled, ‘Blueprint for the Future: Framing the Issues of Women in Science in a Global Context: A Summary of a Workshop’ by Lisa M. Frehill, Willie Pearson, and the Committee on Status and Participation of Women in STEM Disciplines and Careers. We want to focus this year more on the why it is important to have gender parity in STEM fields rather than why we don’t have it right now. The WISRD Inquirer magazine was posted and published under the publications page. It can be found here. The next semester’s schedule has been drafted, and is as follows. We anticipate an increase in number of article submissions, and therefore are attempting to give the editors and designers more time between the final draft deadline and publication. I have been working on the gummy project, the details of which can be found here. I have found a food grade silicone recipe that we will make this week. NOTE: Prepare mold by securely attaching item to bottom of container, using glue gun, glue, paste, etc… Make enough mix to completely cover chosen item, keeping the container as close in size to the item as possible, less waste. Most clear plastic cookware, disposable margarine tubs, silicone containers, etc…, work here. May spray item & inside of container before adding mold mixture. 1. Warm the glycerin in microwave (20-30 seconds) & set aside. (You do NOT add it to the gelatin unheated). 2. Mix the water & the gelatin. Start mixing immediately & keep mixing until all the water & the gelatin is thoroughly mixed together. DON’T STOP mixing or it will separate & congeal in layers. When ready, the mess should be consistent in quality. 3. Heat in microwave, for 20 sec. intervals, & stir until the gelatin is melted and free from lumps. 4. Add the warmed glycerin (and glucose if desired) and stir until blended. 5. Add the coconut oil, and stir until thoroughly blended. It is now ready to use, & should be used while warm. October-November- See Chicken Project for updates. Editing has continued on the first and second drafts of the magazine articles, though they are not yet ready to be published. I have been having an incredibly different time getting in touch with the graphic designers for the magazine, and I don’t know what else I can do to move them along. Because of this, it is unlikely that the magazine will be published on the day we had originally planned for- 12/9. We have added 47 new people to our publication’s mailing list after the work we did at InnovatedLa to spread the word. The first drafts of the articles for the magazine are due this Friday, October 21st. I am predicting that we will receive fewer articles in this first semester than in the second semester by a large margin, so I am expected a limited number of articles. I am almost done with my article on media effect on psychopathy diagnosis. I have not heard from our graphic designers in a few weeks, but I will continue to update them as we progress with the magazine. Once the magazine submissions begin to come in, I should have an easier time updating the blog. Most of my work from the past few weeks has been primarily relating to the magazine, which is difficult to translate into journal posts. I’ve met with the graphic designers, recruited editors, and worked on the uniformity and quality of the upcoming magazine. Each of the tasks has taught me invaluable lessons, but I am having a hard time transferring them over to posts. By doing these things, I have managed to achieve many of my original learning outcomes from the beginning of this year. I am the senior editor for the magazine, I have begun assembling my team of editors and delegating tasks to them, and I am currently in the process of writing my first article for the magazine. My main focus the past few weeks have been on the Life Science Chicken Project, where we have worked on making a proposal for the board in hopes of carrying out the project despite its inherent risks (ie. death of chicken), and coming up with the specificities of the project. I have discussed the ethical arguments behind the project somewhat extensively. I have also been working on the WISRD magazine, which I am the senior editor for this year. We have come up with a semester long schedule for the first issue. Starting my second year as a member of WISRD, I am working on coming up with new learning outcomes for the 2016-2017 school year. This was our first week back in school after break and we got right back into GAVRT. We consolidated all of our data on variable black hole J1800+7828. We started by making a table of the average baseline (taken out of 5 baseline re adings), the peak, and then the following average baseline. We had a bit of a hard time with deciding what format for the table would lead to the best graph, but we eventually decided on a table that has, from left column to right, the Day of Year (DOY) and scan number- like 28-1-, the average baseline, peak, and average baseline. This data was made into a few types of graphs, but the most successful was a multiline graph with individual lines for the peaks and baselines. Until we have have a better idea of what our results mean, we are going to wait to publish them in a journal. Until then, our findings will remain top secret. We also got our 12 inch Meade telescope, which will be used to observe and measure TNOs in collaboration with RECON. This past week in STEM, Aidan and I have been making progress on the RECON (Research and Education Collaborative Occultation Network) mission. With help from Joe and SMAAC (Santa Monica Amateur Astronomy Club), we have finished all the construction and work that can be done without the actual telescope present. This encompassed plugging up a power source to the camera we are using, downloading the necessary software, and the fixing up the timer. We ran into a slight problem when we realized the cords we were provided are not the same colors as the instructions call for, but we improvised a bit. We switched out a white input for a yellow one, and another yellow for a red one, which seems to have worked. Aidan and I also worked on our splash pages for both GAVRT and RECON, which I am having a hard time linking to directly, but are subsets of this page. Aidan and I have been working on our article for this semester, which we plan to publish in the popular science magazine. This is a brief outline of what we plan on writing. brief explanation of radio waves? SMAAC is a group of interested individuals exploring the cosmos one meeting at a time. SMAAC meets every second friday of each month. This week was also the multicultural symposium, where Miana and my workshop on gender diversity in STEM feilds occurred. Looking back on it now, there are a few changes that I would make, but I am fairly happy with the outcome. I think I would have put in one more activity, so that we didn’t have to rely on a guided conversation for so long. I also would have tweaked the icebreaker activity a little, but I don’t think that’s something I could have known without doing it before hand. On that note, Miana and I wanted to get to do a runthrough of the workshop sometime in the days leading up to the symposium, but I unfortunately fell under the weather, which made that all but impossible. Considering, I think the workshop went well, and I’m proud of the work Miana and I did. We can assume that some of the people will be much easier to guess than others, like Albert Einstein versus Lise Meitner. We hope that the visible disparity will be a conversation piece, and make people wonder why we know so much more about male scientists than we do female ones. We also put in some actors from the Golden Age of film, in hopes that the different fields would also cause a disparity. This week in STEM, there was no class on Monday, so I didn’t get as much done as I like to, but I did come up with an idea to bring attention to WISRD from the rest of the school. Earlier in the semester, Joe was telling me about the space we have in the communal area, and asked if anyone had any ideas as to how to make use of it. My initial idea was to post a weekly science experiment that could be done at home by anyone, whether they be in 6th grade or 12th. This week, however, as I began to move forward with the plan, I made some edits. Aptly named by Aidan WISRD Weekly Wonders, each week a question, like, “How many rubber bands will it take to make a watermelon explode?” will be posted in the communal space. People will have an envelope in which they can add their guesses and emails, which will be open for one week. At the following all school meeting, we will go up on stage, do the experiment, and then give the winner a prize. My initial idea for the prize is a 3d printed gift and a short lesson on 3d printing. If this goes well, we will continue it for the rest of the semester. I spoke with Zach Menzer, the assistant head of the high school about the idea, and he was very positive. I am currently pending board approval, though about 70% of the board members have already given the okay. I have a few ideas for the WISRD Weekly Wonders, but, moving forward, I need to come up with more ideas. My first ideas are: watermelon rubber band test, figuring out how many jellybeans can fit in a jar when given the dimensions of the jar and jellybeans, an egg drop, building a bridge out of toothpicks, and how many licks it takes to get to the center of a lollypop. I am having a bit of a hard time coming up with ideas that aren’t too cliche, but I will keep thinking of ‘Wonders’, and add them to the ongoing list. This week in STEM, Miana and I continued to edit our plan for the symposium. As of now, we have a schedule for the workshop, though it is subject to change before the actual date of the workshop, in about three weeks. The reason we are starting with the resume activity before we do anything else is so that no one can try to recreate the results they think that we might want. I will lead the ice breaker while Miana graphs the data, so that we can minimize the wait time for participants. I also noticed that, while I have achieved many of my newer learning outcomes, the majority of the outcomes I came up with at the beginning of the year when I wasn’t quite sure of the direction I wanted to head in have been abandoned. This had made me wonder if my learning outcomes have influenced my learning or if my learning has influenced my learning outcomes. 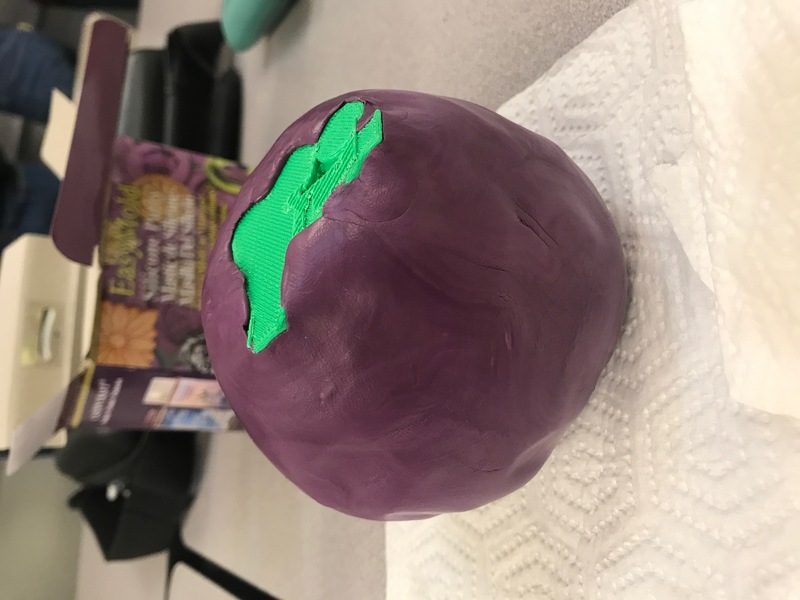 I want to go back and try to work on some of my initial learning outcomes, because when I worked on 3d printing last week, I really enjoyed myself and felt like I had very concrete evidence of my learning. Over the last week, Aidan began to teach me how to use the 3d printer, and we printed a small, collapsible ball. It was my first experience really using a 3d printer, which was exciting. One of my learning outcomes from the first week of STEM was to learn to use the 3d printer, which I have begun to accomplish. 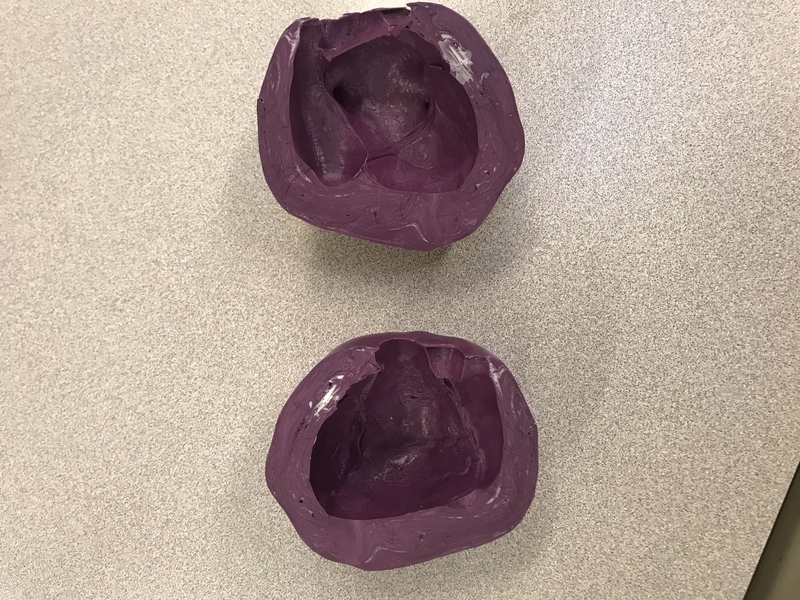 We printed 6 small convex curves and 6 small concave curves, which we connected with rubber bands to form the ball. It’s small, but it’s a start! This week was also a bit frustrating, as I feel like I didn’t accomplish much. Doing the GAVRT work feels a bit monotonous, and like I’m not learning week to week. I talked with Tim about this, and he suggested that he begin to teach me a bit more through labs, so that I can move forward quicker as my basis of knowledge grows. This week in STEM, Miana and I further edited our plan for the Multicultural Symposium, so as to reduce the variables and room for error in our experiment. Earlier in the week, Aidan and I worked on GAVRT (Goldstone Apple Valley Radio Telescope) for the first time in 2016. For the uninitiated, GAVRT is a partnership with JPL (the Jet Propulsion Laboratory), NASA (National Association of Space and Aeronautics), and LCER (Lewis Center for Educational Research) that works to get students involved with radio astronomy. Every other Monday, Aidan and I control a 34-meter radio telescope remotely through our computers. This week we observed NGC7*** (a nebula) and J1800+7*** (a black hole). We did a cross scan, meaning we measured the radio amplitudes in an x-shape around the source, going through the source and recording the peak 4 times. We do this twice to calibrate, and then move on to recording the black hole. Regarding the multicultural symposium, Miana and I decided that, to save time and ensure the most accurate and free of bias results as possible, we would do the Princeton experiment (PNAS) before the workshop with a larger test group. We also decided to give each participant only one resume, either Jamie, John, or Jennifer’s. We changed the resumes so that they were all identical, other than the name and pronouns. Scott, our faculty advisor, will administer the lab during the next faculty meeting. Roughly 50 people will partake, and know very little about the purpose of the lab so as to minimize human error that could occur if the participants were able to guess the purpose of the lab. Once they have finished reading and rating the resume, we will ask them to write their gender identity on the front. We decided to wait to the end to do this so that they are unable to guess that gender has anything to do with the experiment. We will get the results back this week and graph and chart them. This week Miana and I have continued to revise our plan for the Multicultural Symposium. Though we were initially planning to facilitate and hold a conversation regarding women in STEM fields and the negative effects of the inequality, after reading about an experiment done by Princeton (PNAS), we decided to revise our plan. The new workshop will start out with this social experiment, and then we will discuss the reason we got the results we did, as well as the results that the initial researchers got. We are basing our experiment on a test group of 20 people, which is optimistic due to the number of people attending the symposium and the number of workshops, but still possible. Preferably it will be a fairly even gender divide, so that it can best mimic the Yale lab. We have three resumes for three different people, Jennifer (A), John (B), and Jamie (C). Jennifer and John have the exact same resume, only with different pronouns. Jamie has a resume that is practically the same, with small details changed and no pronouns. The idea is to split the test group into two parts, 1 and 2. Test group 1 will receive the resumes of A and C, and test group 2 will receive the resumes of B and C. Each test group will be asked to rate the applicants on a scale from 1-10 for their competence, likability, and pay. Then one of us will explain the experiment or have the members of the workshop read an article while the other one inputs our data into Excel. We will then be able to see if our results are the same as Yale’s or if Wildwood’s community is any different. We will lastly facilitate a discussion about our results and women in STEM on a broader scale. Subject C’s application was written by Miana and me. We were supposed to start back up with GAVRT this week, but they had a power outage, so we will be waiting until our next session to start off the new year. The first week back in class, I have begun a few new projects. A few weeks ago, I presented to the Santa Monica Amateur Astronomy Club about partnering on RECON (Research and Education Collaborative Occultation Network) with them. While on break, they accepted our proposal and have provided us with the necessary telescope and some of the equipment. They have also agreed to a grant of $1000, to use to buy the remaining supplies. WISRD will be a part of a larger group participating in this project, all along the western coast of the US. We will watch for TNOs (trans-Neptunian Objects), and by working with others be able to determine the size of these objects to the nearest 100 km. Why Should We Care About Gender Diversity in STEM? The Wildwood Institute of STEM Research and Development (WISRD) will lead an interactive examination of the causes and effects of gender disparity in STEM fields. Current consensus holds that the underrepresentation of women in the STEM workplace presents a problem for society and science. Do you think so? Participants will seek to answer this question and others and reach a better understanding of the roots and repercussions of gender imbalance in STEM fields. We also want to ask questions, including: How does a male-dominated STEM workforce adversely affect society? What about science? The plan as of now is to provide information about gender inequality in STEM fields, by including infographics and articles, and then to facilitate a conversation on the topic regarding the above questions. The day of the presentation is not for a few more months, so it is likely that plans will shift as the Symposium approaches. Looking back on the first semester, it is easy to tell where I have grown as a student. One area where there is clear advancement is in my reflections, especially in my rubric. Filling out my rubric brought to my attention the areas I have done well in and other areas I have not. I feel the Communicator portion of the rubric is one of my stronger areas. I enjoy presenting about WISRD as it is something that I am so passionate about. Filling out this rubric allowed me to see much clearer what I still have to work on. The largest area I want to get better at is taking risks. For so long, I feel like there has been a punishment for failing, and now that there is not one, it is difficult to make the transition in mindset. I also want to do more work outside of WISRD relating to what I focus on in class. I plan to read a few books over break about radio astronomy and space in general. This following semester, I plan to continue to write weekly reflections as I feel that it helps me chart my growth as a learner and member of the institute. Week 14 is the second and final draft of my rubric. This week in WISRD, I was sick on Monday so I missed out on the chance to control the radio telescope. On Tuesday, I worked on inputting data from the telescope. On Thursday I spoke with Joe on my strengths and stretches and plans for the future. I think that I do well at collaborating with others, like with the radio telescope. I also think that I have a wide range of interests within STEM and take the time to explore these interests. However, I know that there are quite a few areas that I should work on. I think that I need to have more evidence of what I’ve done this year so far. I also would like to increase my knowledge in a few areas, but specifically space. As a result, Joe provided me with a few books to get started with. I will be reading about black holes, the evolution of our knowledge on space, and radio signals. I am hoping that this will provide me with a background so as to better understand what the work I am doing on the radio telescope means. On Friday, I came to the Amateur Astronomy meeting to make a proposal. Joe told me about RECON (Research and Education Collaborative Occultation Network). This project puts telescopes all up the Western coast in 50-mile intervals. These telescopes are used to record TNOs (trans-Neptunian objects). From this project we hope to find out the size of some of these objects. We proposed that WISRD go 50/50 with the Amateur Astronomy club to take part in this project. We need $5000 total, for the telescope, the GPS, and the timer. I have yet to hear whether or not they have agreed to partner with us, but I should know some time in the immediate future. Week 12 is the first draft of my rubric. This week in WISRD we had our poster presentation night, which was very exciting. Looking at my finished poster, I must admit that I’m not very proud of my work. I don’t think I fully understood what was expected of me, and I didn’t meet these expectations. The upside to this, however, is that I now know what not to do for the next poster presentation. I want to have more on the poster about the process and include better graphics. I also think it would be wise to include more about my plans for the future regarding the project. Furthermore, I know that I want to make clearer learning goals that more accurately integrate the the standards from the syllabus, which I will attempt to do in this reflection. Develop an information gathering strategy that works well for the radio telescope, such as deciding whether or not to transfer all work online now as opposed to transferring it to a spreadsheet later. Next, I want to achieve a few things having to do with the learning outcome about using appropriate writing styles and conventions. Attract other people to WISRD, whether it be through the magazine, presentations, or another form of outreach. Hopefully these learning outcomes will suffice for the remainder of the school year and provide an accurate portrayal of my growth as a researcher. This week in STEM, I was very busy. On Monday, I recorded radio emissions from a quasar 3C295 and from Jupiter. On Tuesday, I worked on my poster presentation for the upcoming WISRD night and edited an article for the magazine. On Thursday, I went to the California State STEM Symposium to present and watch presentations. Not only did I learn things in class this week, I also learned quite a bit all day Thursday from attending various presentations. I will mostly touch on the big ideas I took away from the presenters, as I took fairly extensive notes containing a fair bit of superfluous details. In neither presentation did I learn much specifically relevant to what I am studying in STEM, however they both brought up great ideas for how to get others involved in STEM. The first presentation I went on was titled the STEM Behind Hollywood. In this presentation, it was highlighted just how beneficial technology can be for getting students involved. The TI Inspire was used, and I was shocked by its versatility and relevance to different aspects of STEM. One of the main points the presenter was trying to get across was the idea of mixing science and science fiction, as well as connecting to the outside world as much as possible to get students involved. I was also able to get the contact info for a practicing forensic anthropologist, which does directly apply to my interest in forensics. The next presentation I went to was titled Pit and the Pendulum, and was about connecting STEM and Language Arts. The presentation was very hands on, and the spectators were all put in groups and asked to read Poe’s short story by the same title. We were then asked to find out if it was mathematically accurate, which it turned out to be. My main takeaway from this presentation was the idea of introducing concepts after students have already experienced them. Overall, the day was offered countless insights on how to involve others in STEM, as well as giving me many ideas about how to get people to join WISRD. This week in STEM was not my most productive week. There was a miscommunication on Monday, which made me unable to work on GAVRT this week. Instead, I spent the day editing my first article for the popular science magazine. As a result, I completed one of my learning outcomes, or at least started to. I am beginning to better understand how to write an article. I definitely had a few misconceptions about what an article needed to include, but I do feel much clearer on the topic now. I learned that longer in no ways means better, and that keeping things concise can help make them more enjoyable for others to read. I also learned the importance of dynamic verbs and their effect on a piece of writing. However, I think the most important lesson I learned is just how much something can be edited. I now understand that just because a piece of writing is covered in red marks, that doesn’t mean it was a bad piece of writing. A good editor can find things that need to be changed almost anywhere. The next step I want to take is learning how to edit someone else’s article. I will hopefully spend time this week learning a bit about that, as I’m definitely not very experienced in this area. Later in the week, Aidan and I started work on our GAVRT (Goldstone Apple Valley Radio Telescope) poster. We decided that the poster will cover what GAVRT is, what Aidan and I do when working with GAVRT, what the electromagnetic spectrum is, what we can learn about space from radio signals, and what we plan on doing next regarding GAVRT. I also found out I will get to present on this upcoming Thursday, the 29th, at the California State STEM Symposium. Conor, Dylan, Joe, and I will be presenting the WISRD institute model and teaching others how they can implement it in their schools and classes. For all of Thursday, we will be at the Anaheim Convention Center, both watching presentations and doing our own. I hope to learn more about how I can be active in the STEM community, as well as learn about opportunities for women in STEM. This week in WISRD, due to standardized testing, we had one regular class period and one shortened period. My main priority was working on the presentation for the InnovatEd L.A. presentation. This weekend was the event, which went very well. I helped run the Wildwood booth where I talked to people about the Wildwood journal and popular science magazine, as well as a few short science experiments. I learned a bit about the difference between centrifugal and centripetal force and how they work. Essentially, centrifugal force is how an object flies away from the center of something and centripetal force is what keeps something moving at the same speed along a path. However, my main takeaway from this week was how unique and exciting the work we at WISRD are doing. I feel so proud to be a part of this institute. Looking at my revised learning outcomes, I wasn’t able to work on anything regarding them this week, as all I did was prepare for the presentation. This Monday I will get another chance to use the GAVRT radio telescope, and after that I plan on tackling my first learning outcome- what we still have to learn about radio signals emitted from Jupiter. I also plan on fine-tuning my article on Urbach-Weithe disease and in the process working on my fourth learning outcome- how to write a scientific article. I must admit, other than reflecting on my learning outcomes, I still am somewhat unsure as how to successfully write a reflection as every person I ask gives me varying answers. Due to this, I would say the most important learning outcome and most immediate one I have is to learn how to correctly write a reflection and what specifically that entails. This week in WISRD, we only got to meet once due to Outdoor Ed., but I did get a few opportunities to think about the topics I’m currently studying. On Monday, I began to work on the presentation for the InnovatEd LA event this upcoming weekend, October 17thand 18th. I am collaborating on this presentation with Conor and Dylan, which is likely mostly what I will be working on this week. The presentation covers what the Wildwood Institute for STEM Research and Development really is, and how other schools can implement a similar program. I will also be talking a bit about what it is in particular that I am working on, the radio telescope. I will also be doing a live presentation on this later on in the day. While on Outdoor Ed., I got a chance to look at a globular cluster of stars through a high-powered telescope, as well as well as a few other stars. Once we got back from this trip, I decided to attend the amateur astronomy club meeting at Wildwood. While there, I learned quite a few things about how we can view climate change on Earth from space. The speaker works at JPL and has dedicated years of her life to learning about this. There were quite a few statistics she gave that were truly staggering, and that make it hard for me to see how anyone could doubt the credibility of climate change. For instance, she said that if we continued the current levels of carbon emissions, the minimum rise in temperature in the next millennium would be 4° F, with the maximum being 7° F. While both these numbers sound fairly small, if the temperature were really to rise 7°, the climate on Earth would be the same climate that we had 30 million years ago, when Earth seemed almost like a completely different planet. After this meeting, I plan on finding more ways for me to get involved in the science community and learn more about astronomy. I also came up with some clearer, more realistic learning goals. This week in WISRD, I used the radio telescope for the first time. I alternated between taking signals from a black hole, 3C250, and radio emissions from Jupiter. I recorded the signal five times while it was at a steady rate, and then recorded the peak it reached. I then recorded the steady rate again. I repeated this process about 4 times for both Jupiter and 3C250. From recording radio emissions from black holes, we can learn about their location and size. Black holes emit radio waves as they accumulate matter, allowing us to better understand how black holes work. By continuing to record radio emissions, we can learn more about the science behind how back holes function, which we currently know so little about. From recording radio signals from Jupiter, we can find out more about its orbit and atmosphere. Scientists first learned that Jupiter had a magnetic field by recording its data signals. We also learned that Io, Jupiter’s moon, is largely responsible for the fluctuations in data signals we get from Jupiter. However, we still have so much to learn. For instance, we don’t know if any of Jupiter’s other moons affect the radio signal, which we could learn from continuing to use radio telescopes. I also learned more about Urbach-Weithe disease this week. This disease targets the amygdala, and calcifies it. As a result, people afflicted with this disease often lose the ability to feel fear. The only way that doctors have been able to create a fear response in people with Urbach-Weithe disease is by giving them oxygen with a high concentration of carbon dioxide, sufficiently creating the feeling of asphyxiation. This could mean that the amygdala is only responsible for a fear response as a result of external stimuli, as opposed to internal stimuli such as asphyxiation. This study is helping the scientific community better understand how the amygdala works, therefore allowing for a better understanding of how to control or limit the fear response. This finding could be life changing for people who suffer from anxiety or panic related disorders. By continuing to study Urbach-Weithe disease, we can learn countless things about how the brain works and how necessary fear is to ensuring human survival. This week in WISRD I continued to learn more about Urbach-Weithe disease and started to learn about the electromagnetic spectrum. I am writing an article on Urbach-Weithe disease, so I am in the process of doing research on the topic. So far I have learned that Urbach-Weithe disease is an extremely rare, hereditary disease that can skip generations so is almost impossible to predict who will suffer from it. The primary symptoms of the disease are skin lesions, swelling of the vocal glands, and in about 75% of cases, calcification of the amygdala. I learned more about what the amygdala does, however, at this point we are still unsure as to its exact purpose. I know that it is responsible for a large amount of the emotional responses our bodies have, particularly intense emotions such as fear and aggression. When the amygdala becomes calcified, it can completely eliminate the fear response. I did research on what this might entail and came across the case of S.M., who suffers from Urbach-Wiethe disease. Since a young age, she has never felt any sort of emotional fear. However, when her brain was being studied, neuroscientists were able to elicit a fear response by temporarily cutting off the amount of oxygen she breathed. This may prove that the amygdala is not completely responsible for fear, as previously thought. I was able to become better at finding credible information about a relatively unknown topic. This week, I learned not only about Urbach-Weithe disease, but also about how to research and develop an information gathering strategy as well as making observations. I also learned about the electromagnetic spectrum this week in preparation for using the radio telescope. I learned about the different kinds of electromagnetic waves and the differences between them. Radio waves are the lowest on the electromagnetic spectrum, meaning that they have the longest waves and the lowest frequency. They are followed by microwaves, Infra-red, visible light, ultraviolet light, X-rays, and Gamma waves, the highest wave on the electromagnetic spectrum with a short wavelength and a higher frequency. I learned that wavelength is measured in meters and that frequency is measured in Hertz. Learning about the electromagnetic spectrum also afforded me with an opportunity to learn how to research and gather information. This week in WISRD, I’ve continued to solidify my plans for the year to come. In forensics, I have resumed identifying unknown chemicals. I have successfully completed about 8 tests for the first chemical, known as Scogain. I have learned how to use iodine, silver nitrate, and low concentration hydrochloric acid to help identify differences in chemicals. I have also continued to learn lab safety procedures. Next week I should hopefully finish up identifying a second chemical so that Ella, Sky, and I can work together to match the last unknown chemical. I also talked with both Joe and Scott about my plans for the year to come. For the GAVRT mission, I decided with Joe that I will start by studying Jupiter, as it is currently in optimum position. I will then move on to studying black holes as the year progresses. I am very excited to get started, and it looks like I will be having my first session sometime this week. Due to some technical errors, I wasn’t actually aware that I was an assistant editor for the science magazine until this week, which is another thing that I am looking forwards to immensely. I have two ideas for my first article, but I will decide on one for sure and start writing this week. This upcoming week looks like it will bring lots of new and exciting things. This week in WISRD I continued to learn about forensics. I went to the library last weekend and picked up a few books on the topic, which I am in the process of reading. Ella and I have been working on identifying unknown chemicals. We only had two days of WISRD this week, but in the first day we attempted to identify a chemical without any prior knowledge of how to complete that task. When we met again, Tim encouraged us to use a pre-made lab meant to teach you how to identify unknown chemicals. We started working on that, but we still have quite a bit left to do. While doing this lab, I began to learn more about chemistry, as I’d never taken a class on it previously. I learned a bit about the pH scale (acids and bases), proper lab safety procedures, and how to use a higher powered microscope than the ones I was used to. On a separate topic, Joe and I discussed the radio telescope a bit more. I read Etney’s weekly reflections, and I am a bit nervous to get started, as I have no idea what I’m doing. However, Joe and I plan to work together sometime this week to get me used to using the telescope. This week in STEM I have gotten a much more concrete understanding of what I plan to learn about in the year to come. I have gotten started on learning about forensic science, as well as completing my first lab. For this lab, I tried to extract my own latent fingerprints off of a glass slide. I did this by printing the slide, putting the slide in a large beaker, placing a few drops of superglue in a smaller container inside the large beaker, and making the beaker airtight. I then heated the beaker to 60° C for two hours. Once the two hours were up, my latent fingerprints were clearly visible on the glass slide. This happened because the cyanoacrylate in the super glue, once heated enough that it became gaseous, stuck to the oils from my fingerprint. Midway through the week, Ella Grossman and I joined up to learn more about forensic science. She sent out an email to Dr. Wang, the forensic scientist who came to visit and present at Wildwood, asking him about any insights he had to offer into the world of forensic science. Ella and I also brainstormed some other labs we could do, as well as checking out books from the Santa Monica library on forensics. Joe also asked me if I was interested in working with the radio telescope, to which my answer was a vehement yes. We will hopefully talk more about our plans regarding the telescope in the week to come. I also plan on helping out with the scientific journal, however this is another topic that I will learn more about next week. 1.) Any fears and concerns regarding week 1 of STEM? I think that my only concern right now is that everyone else seems so experienced, whereas I have little to no experience in most of the STEM areas of research. I’m a little bit concerned about how I’m going to start a project, since I’m interested in such a variety of things, but I know practically nothing about them. I’m sure that I’ll be much more knowledgeable about whatever topic I choose to pursue by end of the year, but getting started without any basis of knowledge seems difficult. 2.) What are your topics of interest? As I said before, I’m interested in a lot of different things. A few of the topics I’m interested in are fairly broad, but as I don’t know much about them, I don’t want to rule out certain areas before I’ve even given them a shot. I did talk with Tim about my interest in forensics, which I think is where I plan to start. 3.) What are some ideas of learning outcomes? I don’t have any concrete plans for what project I will be doing yet, so I’m having a difficult time coming up with learning outcomes. Right now I’m thinking that I might start out by gaining a fairly comprehensive level of knowledge of basic forensics, and then once I know more, come up with an individual project. I would like it if my project were able to combine 2 or more areas of interest, like 3D printing or coding.